I hopped on the trail after work for an 8 mile quick ride, that is just about all I can get with the daylight being so short this time of the year. This is one of the nicest times of the year to ride with the cooler temps and that raw feeling of late autumn still a few weeks away. I popped open beer #323 after said ride, India Style Rye Ale by Summit Brewing Company, and I was truly surprised that this far into it I have come upon a style of beer I have yet to have. Summit, from St. Paul, Minnesota, brews this in the style of a Rye Beer. 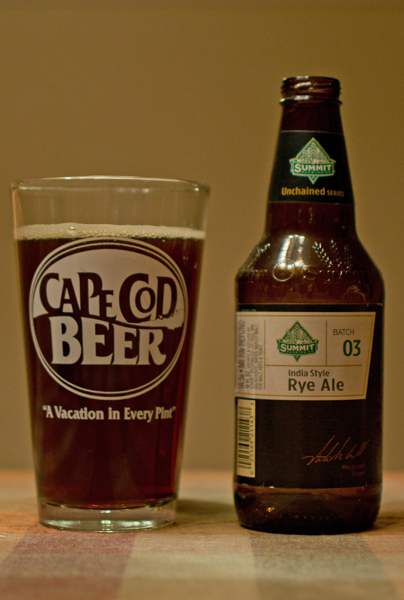 Rye Beer is just that, beer brewed with rye, the grain that is. Appearance – Dark brown color with a tiny off-white head. Nose – Smelled like rye bread…crust and all. There was also a bit of pine and caramel. Taste – Well…it did taste a bit like rye bread, there was no mistaking that. The hops are pretty noticeable with a pine like flavor. It was very earthy tasting and even had a bit of a nuttiness to it. The rye bread flavor also lasts on into the aftertaste. Mouthfeel – Medium bodied, with an ample amount of prickly carbonation. It had a decent bitter bite to it also. Overall – For my first Rye Beer, I thought this was pretty good.